- Individual tax payers with income up to Rs. 5 lakh taxable income will get full tax rebate, Goyal announced. Even those earning Rs 6.5 lakh will not have to pay tax, if they invest in specified savings. TDS on fixed deposits and postal deposits will be exempted for interest earned up to Rs. 40,000 from Rs. 10,000 currently. Benefit under 80IBA of IT Act will be extended for one more year for affordable housing. - To promote entertainment industry, single window clearance for Indian filmmakers will be introduced. In order to eliminate piracy, he announced a new scheme. Anti-cam cord regulations will be introduced in the Indian Cinematograph Act to prevent piracy and contact theft of Bollywood films. - India is now leading the world in mobile data consumption. The cost of data and voice call is among the lowest in the world. More than three lakh people are digitally serving the people. "Villages are being converted to digital villages. We will make eight lakh digital villages in the next five years," Goyal said. - India's installed solar capacity has grown 10 times in last five years. - Rashtriya Kamdhenu Aayog will be set up. 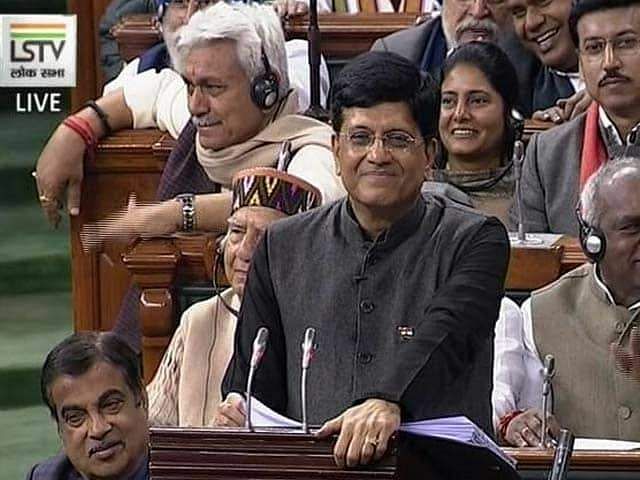 "This government will never back off when it comes to protecting our mother cow," Piyush Goyal said. - Job seekers have become job giver, the acting finance minister said listing out schemes such as Stand Up India and Start Up India. 25 per cent of sourcing for government projects will be from MSME, of which three per cent will be from women entrepreneurs. - An AI portal will be developed soon, he announced. - The Defence Budget has crossed Rs three lakh crore for the first time. Additional funds will be provided, if necessary. - 14 out of 21 AIIMS were set up under this government. The 22nd AIIMS will come up in Haryana. - Government will provide 6000 per annum for small and marginal farmers up to two hectares of land. The scheme has been named Pradhan Mantri Kisan Samman Nidhi. The money will be transferred directly to the bank accounts in three installments. The scheme is funded completely by the Central Government. "We will launch a mega pension scheme — assured monthly income of Rs 3000 for Rs 100 pm (joining at 29) Rs 55 (18 years). Equal share by govt. 42 crore workers . Rs 500 cr allocated for Pradhan Mantri Shram Yogi Mandhan. It can become the biggest in 5 years," said Goyal.